One of the most frequently questions asked is what role do Human Resources and Line Management play in the implementation of the CBM within a company. Most people think that this is a Human Resources project and therefore should be handled solely by the HR department. This is incorrect as all Managers and Line Managers have Human Resources functions as part of their roles and responsibilities. The Human Resources Department may control some functions (i.e. 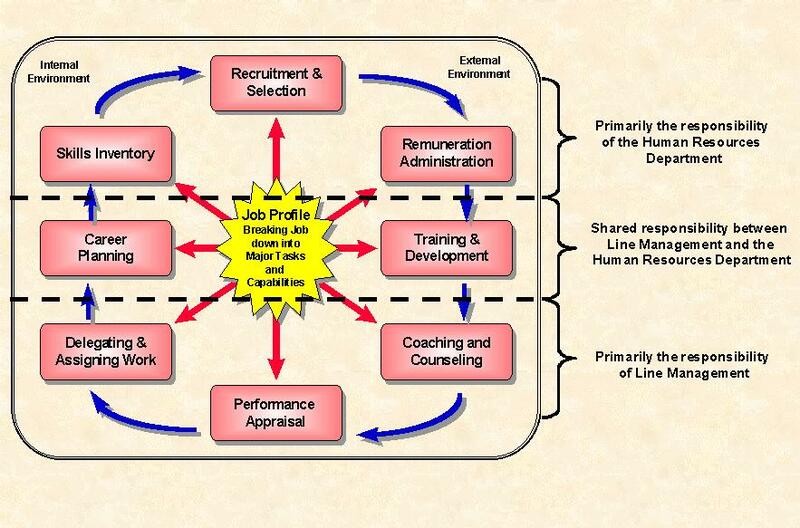 Remuneration, Recruitment and Selection, etc. ), but certain functions are a shared responsibility between Human Resources and Line Management where other functions are the responsibility of Line Management. Therefore it is extremely important that both parties (Management, Line management and the Human Resources Department) will be involved in the process to implement the CBM. Management/Line Managements support commitment and participation is one of the success factors for implementation of the CBM. In fact they play a major role in compiling and updating the Job Profiles of their subordinates. The following topic will have a closer look at the implementation of the methodology within a company. These are just guidelines and each company should find the best way to implement the CBM within the company. The first thing to remember is that this is no easy tasks. It requires the involvement of Human Resources, Line Management and the employees reporting to Line Management. It is also a very time consuming process and be assured it cannot be done within a month or two (depending on the size of the company). Most of the time will be spend on compiling the Job Profiles. The good news is that once you started with the profiling, it will become easier as you go along. A lot of the information gained from one job can be used again in another job (this is seen when you start compiling capabilities and their definitions). Ensure that all HR employees involved are trained in the methodology, as they will be the key role players in training and assisting line management with this mammoth task. The whole process must be handled according to project management principles to ensure that it is controlled at a high level and not too much time is wasted on waiting on responses and actions from the project members. Before implementing, Top management commitment is required. Without this commitment and support, you will not be able to implement the methodology successfully. It will always be seen as another HR effort. Management support will give validity to the project and gain the support of Line management if the monitoring of progress is reported at this level. All line managers and Top management must be trained in the methodology so that they will be able to understand what you are trying to achieve. Line management will also be key role players, as they will have to relieve their subordinates from duty to participate in the job profiling exercise. If possible involve the unions. Even if just to explain what you are doing. Their acceptance of the total implementation project and the output thereof is very important. There will be changes in the way things are done and if they reject this, you may have problems getting acceptance from the employees belonging to these unions. Especially if remuneration will be based on the results of the CBM implementation. Do not try and implement this in the company as a whole. Rather break the process into phases and do Department by Department, but remember that all Human Resources functions must be adapted simultaneously to ensure smooth transition to the new methodology. As the Job profiling exercise will provide you with an overload of information, computerise the profiling exercise. This will help you with standardising definitions, levels of capabilities and make re-use of information allot easier. Communicate the intention of implementing the CBM as wide as possible to the lowest level of the organisation and keep the employees informed on the progress made. This will enhance their support to the project.